Since we’ve been on a gin-and-orange kick, I thought I’d add the Stork Club Cocktail to our list of Prohibition-era drinks. The Stork was famous mainly for its celebrities and its “New Yorkiness,” but its flagship cocktail is worth notice, too. Society journalist Lucius Beebe focused on the Stork Club’s bar and its patrons in his 1946 Stork Club Bar Book. Snide, opinionated and clever, the Bar Book is partly a wonderful, name-dropping public relations piece for the club, and partly an annotated compendium of cocktail recipes. The cocktails range from old classics to contemporary variations suggested by, and named for, the bright lights of the “saloon society,” Beebe’s term for the movie stars, journalists, politicians and other celebrities who frequented the Stork Club to see, to be seen, and to be gossiped about. Beebe attributes the Stork Club Cocktail to the Stork’s service captain, Eddie Whittmer. Its basic ingredients would have been very familiar in the Prohibition era: gin, and sweet, flavorful OJ to cover up the gin’s potentially dodgy character. Shake lightly, or stir, with ice until cold. Strain into a chilled cocktail glass. Optionally express and garnish with orange. 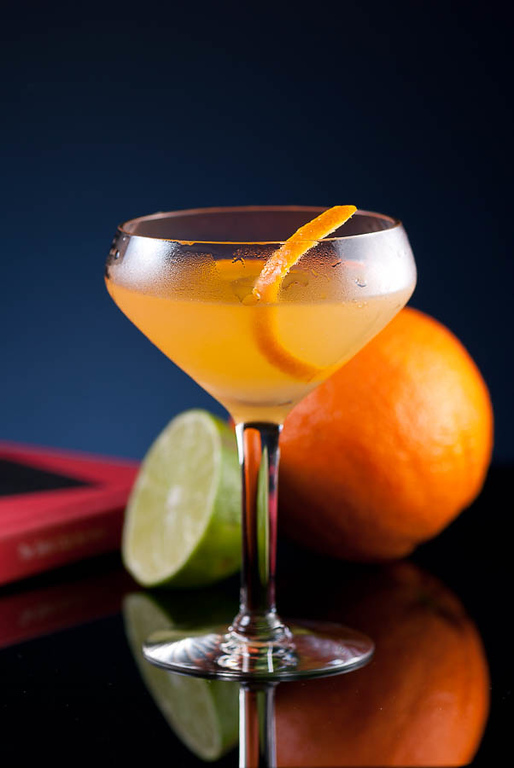 Nearly all the cocktail books that include the Stork Club interpret “juice of ½ orange” to mean an ounce (30ml) of juice. When I first started making this cocktail, I was using London dry gins, and an ounce of orange was far too much. The flavors just didn’t blend well, and both the gin and the orange tasted strange. I cut back to a half ounce, and that improved the drink considerably. It got me wondering if Prohibition-era oranges may have been smaller or less juicy than the standard Navel oranges on my grocery shelf. “The Stork Club Cocktail” at cold-glass.com : All text and photos © 2011 Douglas M. Ford. All rights reserved. I personally am a huge fan of Bombay Gin…it is quite a smooth gin- do you think it would be overpowered by the OJ? Love cointreau in anything…will definitely try. I love, not only your fab cocktail recipes, but how you incorporate the background/origins of the drink in your posts. Love your blog! I think either Bombay Dry or Sapphire would be good in the Stork Club if you push up the sweetness a bit. Since you enjoy Cointreau, I’d recommend that you increase its portion a bit to balance the gin’s juniper profile. I’m glad you enjoy these articles, thank you for commenting. One tip I’ve picked up for cocktails with o.j. is to use good juice oranges in season for the best flavor. That would include Valencias in the summer and Cara Caras in the winter for U.S. grown fruit. Otherwise as you note, it is easy to ruin a cocktail with too much o.j. I’m with you there. One of the exercises for those of us who live in northern climes, far from orange growers, is taking extra care to know what’s really in season (and where it came from.) I noticed a few Cara Caras in my grocery last time I was there; I may have to make up another cycle of orange cocktails just to celebrate. just to inform you that the “Stork Club Bar Book” was initially published in 1946. Corrected in text: 1946. I’m grateful. Just made this and although I didn’t have a bar spoon to measure, it is delightful! Never liked dry gin much (except Sapphire) so I splurged on the Old Tom….wish Pa. state stores had more of a variety of this, it’s a whole different gin!